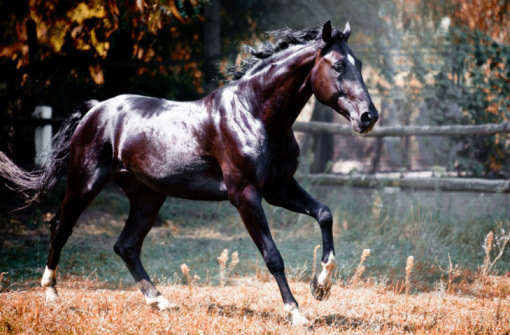 Your horse’s coat can tell you a lot more than simply if he’s receiving the proper nutrition. While coat condition is important, it is not the sole indicator of equine health. Veterinarians will, however, look at coat condition as a piece of the equine health puzzle; they’ll assess it along with body condition score and other markers of general health to ensure that a horse is truly healthy. And if your horse doesn’t always have a show-ring sparkle, fear not: There are plenty of very healthy horses that don’t have perfectly shiny coats, whether due to exposure to sun (bleached hair), or lack of regular grooming. There are no shortcuts to a nice hair coat; you simply can’t fake it ‘til you make it. While silicone sprays may mask some coat issues, they won’t cover up any underlying problems — and they certainly won’t treat a poor hair coat! Dr. Holly Schmitt, of Foxwood Equine Sports Medicine based in Lexington, Ky., compares silicone sprays to hairspray for people—they may add a little extra oomph for a short period of time, but in the end they will not “fix” a poor hair coat. Nutrition is the foundation for healthy horse hair, notes Dr. Schmitt, especially essentials such as fatty acids. Ensuring that your horse is being fed a quality feed in the proper amounts will go a long way to garnering a healthy hair coat—that and a lot of elbow grease! While dapples are lovely to look at, they don’t necessarily mean your horse’s health is top-notch, notes Dr. Schmitt. To use another human analogy, assuming dapples equate to health is like assuming that everyone with a perfect, sun-kissed tan is healthy. Dapples typically have more to do with grooming and color variations in individual coats than they do with nutrition. While most people believe that temperature is what triggers horses to either begin growing a coat in the fall or shedding a coat in the spring, it’s actually the length of daylight that influences both hair growth and shedding. This is why some riders who compete throughout the winter will leave stall lights on at night in an effort to trick the horse’s body into thinking it is not winter. We’ve heard so much about Cushings (Pituitary Pars Intermedia Dysfunction, or PPID) in the last few years that many owners anxiously watch their horse’s hair coat, waiting for them to begin shedding at the first sign of spring to indicate that all is well. 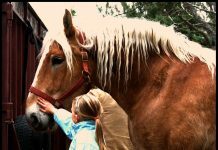 Dr. Schmitt reassures horse owners that a horse’s long coat is not always a hard-and-fast indicator of any metabolic problem. Horses typically start growing longer hair when the daylight begins to shorten in late summer, says Schmitt. “The speed at which this coat starts growing, and then starts shedding in the spring, is also influenced by breed and age,” she notes. Just because a horse is quick to grow a winter coat or slow to shed in the spring does not mean he has Cushings. If, however, he does have a cresty neck and fat pads on either side of the tail or behind the shoulder blades, a thorough exam and bloodwork may be warranted. Veterinarians are trained to recognize the subtle signs indicative of metabolic conditions and can advise on management changes and treatment options. The presence of dandruff is not necessarily an indicator of poor health, notes Dr. Schmitt. Many horses that are not groomed thoroughly frequently will have some signs of dandruff. Ironically, horses who are bathed too frequently may also have drier hair coats and dandruff. “Excessive bathing strips the natural, protective oils off of the coat,” says Dr. Schmitt. Another hazard of over-bathing is that it can exacerbate diseases such as scratches and rain rot. “Many of my clients think they need to bathe and scrub these problems away, but it really prevents the horses’ own defense system from working effectively,” explains Dr. Schmitt. While dandruff itself is not a huge issue, an increase of dander in a well-cared for horse should be noted, Dr. Schmitt advises. It can be an indicator of stress, parasites or immune issues. In addition to the intestinal damage worms can cause your horse, they can affect his coat, as well. Worms are parasites that feed off the nutrients your horse is ingesting. If a horse is carrying a heavy parasite load, meaning he has a lot of worms in his system, he will begin to look unthrifty as the worms ingest the nutrients your horse is eating for themselves, instead of allowing his body to utilize them. Owners of horses with increased worm loads will start seeing signs of poor nutrition such as a dull, dry coat; loss of condition; and decreased energy levels. While nothing can replace proper nutrition and good grooming, a horse’s hair coat should still be used as an indicator of overall health. Any sudden change in coat condition, whether the onset of dandruff, a sudden altering of shedding patterns or a change in coat quality, should warrant at least a chat with your veterinarian to see if further investigation is needed. Previous articleIs Your Horse Unsafe? Based in Lexington, Ky., Sarah Coleman has a soft spot for chestnuts with chrome, including her off-the-track Thoroughbred, Chisholm. The pair competes in the hunters. What about a horse with a greasy coat? He appears to have reasonable body weight, is on a grass mix hay, eats a small amount of beet pulp plus a lower protein complete feed with added fat. He has recently changed barns but was also receiving the beet pulp/complete feed prior to that. His coat got greasy after he arrived at the new barn. Ideas? It’s hard to get my roan to shine. Too much white mixed in.